With the large quantity of health tips thrown at the average American audience on a regular basis it’s no small wonder that we get healthy confused with unhealthy. While no one’s going to argue that a Big Mac is a part of a well-balanced diet, there are several myths going around about foods that are good for us that really aren’t. Below you’ll find just a handful of the foods we’ve been tricked into thinking are healthy that may be causing us more harm than their alternatives. Agave syrups and nectars are often touted as better alternatives for sweetening your food without the use of sugar or high fructose corn syrup. The unfortunate fact is that agave syrups are often just as heavily processed as high fructose corn syrup, and in some cases can actually contain more fructose. Your best bet is to stick with natural sweeteners like raw honey if you’re looking for a healthy sugar substitute. You might be surprised to find out that fish actually isn’t a better, kinder alternative to other kinds of meats in a lot of different ways. There are two main kinds of fish: farmed and wild caught. Farmed fish live in conditions that are just as terrible as any other factory farmed meat source, constantly dying of diseases due to the fact that they end up swimming in a sea of their own feces. To combat this farmers pump the water full of chemical antibiotics, which combine with the junk diet they’re fed and ultimately make their way to your body when you consume them. Wild caught fish are better, but not by a huge margin. They’re full of mercury which can be poisonous in large quantities. You can learn more about which fish to consume and how to avoid those dangerously toxic levels here. You might be surprised to learn that juice isn’t the best thing in the world for you if you’re trying to avoid large amounts of sugar. Most people drink it first thing in the morning to get an energy boost, but really all you’re getting is a sugar boost. 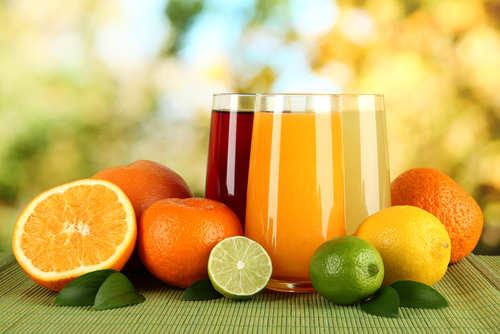 Instead of drinking sugary fruit juices in the morning, consider switching to vegetable juices. You can add an apple to the juice to sweeten it, or you can make a fruit and/or vegetable smoothie. They contain more fiber and less sugar, in addition to other nutrients depending on which vegetables you juice. Gluten free foods are the latest diet trend that has people assuming that anything labeled as such is automatically better for them. Unless you happen to have Celiac disease, odds are good that the gluten free version of whatever you’re eating will have the same effect on your body as its gluten filled equivalent would. In fact, gluten free products usually use flours and fats that are less nutrient dense, meaning you’re actually paying more for a nutritionally inferior product. Another label often misconstrued as synonymous with healthy is “fat free.” Fat free doesn’t mean calorie free, and just because a product boasts a fat content of zero doesn’t mean it’s healthy. A pint of ice cream may proudly advertise the fact that it’s fat free but it still has plenty of sugars in addition to other things that don’t exactly make up a balanced diet. Be mindful when reading packaging for a product before you buy; don’t be taken in by gimmicky marketing. Make sure to read the ingredients list and nutritional information and decide for yourself whether or not the product is actually healthy. This entry was posted in Informational, News and tagged Healthy Eating, nutrition. Bookmark the permalink.